By being accountable to your organic waste you take a step closer to a more sustainable planet. The worm hive is designed with ±2mm spacing between slats to ensure good airflow and the correct drainage. The worm hive can be used solely to compost dog poo or can be conveniently placed near the kitchen to compost all kitchen scraps. Due to the design of the worm hive it is a low maintenance, high yield portable worm farm that is perfect for everyday use. This system is calibrated to start off with 1 kg of composting worms (to be ordered from The Green Guerrillas) to ensure a healthy population of worms that will convert organic waste into vermicast. Upon purchasing your worm hive from The Pole Yard, place the worm hive on a level shaded area in your garden. 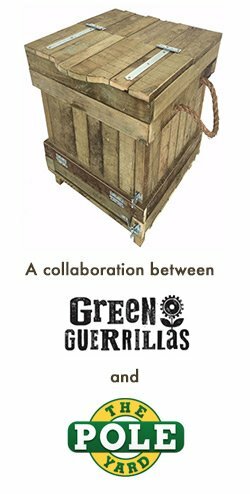 Contact The Green Guerrillas to place your order of 1 kg composting worms which will be prepared in a well-balanced nitrogen/carbon substrate, that will kick-start your worm colony immediately. The advantage of this system is a non-stress, no-fuss, easy operation that ensures that you do not harvest the worm cocoons as that would negatively impact the worm colony. This system does not collect the leach from the substrate often referred to as worm tea. Despite the hype of worm tea (leach), there is a possibility of pathogen contamination and an anaerobic liquid that predominantly is acidic and not as beneficial to plants as some might believe. 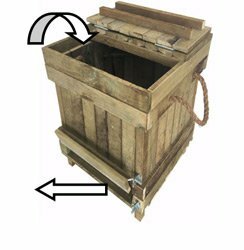 This TAN-E wooden worm hive is designed in a flow-through system which means that you add the organic matter from the top and you harvest the vermicast from the conveniently designed bottom hatch. Q: Why is this not a three stack system? A: The three stack system is more labour intensive, has limited growth for the worms and can result in over harvesting of the worm cocoons. Q: Why is this system not capturing the worm tea? A: The leach of the worm hive is usually due to over watering and carries the risk of a pathogen contamination and is not as beneficial to your garden as you may think. Q: Can I put the dog poo vermicast on my vegetable garden? A: If you are using the worm hive only for dog poo, then we suggest that you use the vermicast only on your lawn and your ornamental plants. Q: How much can I feed the worm hive per day? A: In ideal conditions the composting worms can eat their own body weight in organic matter, however because worms have no teeth and if you are not shredding the organic matter the worms take a little bit longer to break down the “food”. We advise you to be gentle in the beginning and if you are using the worm hive for kitchen scraps you should shred or blend the scraps before your feed the worms. This will ensure that it is easier for the worms to go through the food. If you are using the hive for dog poo then make sure that you do not over-feed the hive in the beginning, let the worm colony grow and slowly increase the feed. Q: Where can I learn more about composting worms? A: The Green Guerrillas run fortnightly courses on composting with worms. Order your Worm Hive Now!